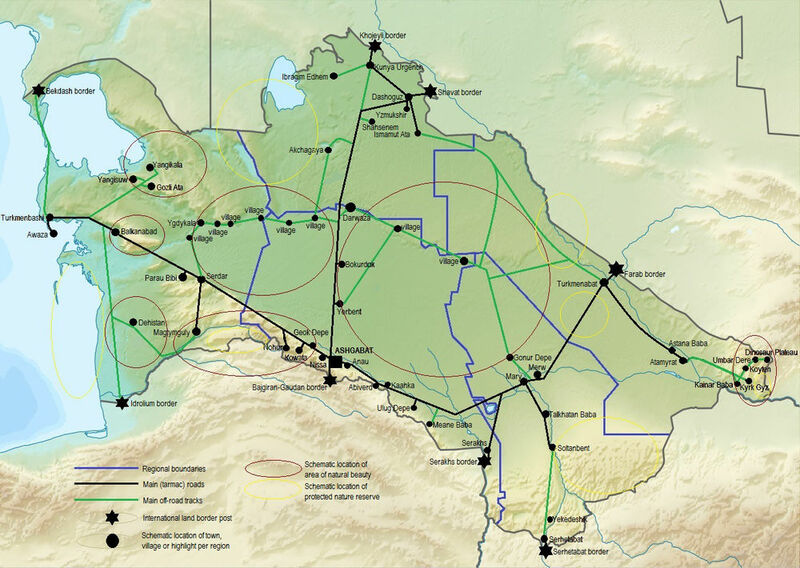 The national capital of Turkmenistan is flanked by the Kopetdag Mountains in the south and the Karakum Desert in the north. Ashgabat is not only a central transportation hub for travel to the various regions in the country as well as an entry point into Iran, but certainly justifies a visit in its own right: the white marble city, also known as “City of Love” hosts a variety of accommodation and dining options, the international and domestic airport and the central train station, but also beautiful museums, numerous parks and fountains, national monuments, the national hippodrome and various private Ahalteke stables and farms, the largest mosque in Central Asia, the largest weekend bazaar of Central Asia and of course the UNESCO World Heritage site of Nissa. Ashgabat is also the starting point for day trips into the surrounding mountain area. A visit of the city center by night gives the modern skylines a spectacular look. The Independence Park hosts the Ruhnama Book Monument, the Monument dedicated to the fifth year of independence and the Monument dedicated to the tenth year of independence. 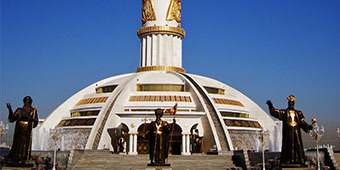 The latter monument, in the shape of a yurt, stands out because of its tall 91 m marble column, with a 27 m high golden peak and flanked by massive statues of famous Turkmen historical figures. A statue of the first President of Turkmenistan stands in the path leading up to the main statue. 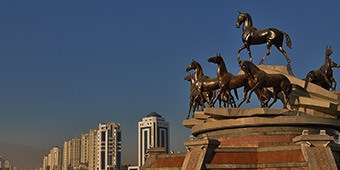 In the center of Ashgabat, with a view onto the central square, we can see a monument that consists of 10 Ahalteke horses, the pride of Turkmenistan. 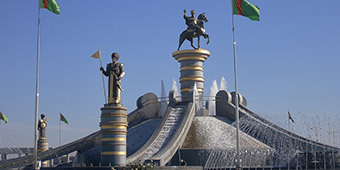 In front of the monument is a gold statue of the first president of Turkmenistan. Both the Independence Monument and the Horses Monument are favorite places for wedding photo shoots. 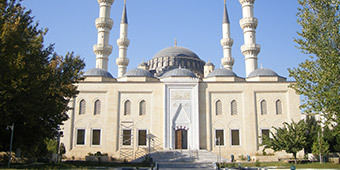 The mosque, inaugurated in 1998 and constructed by a Turkish construction company, is named after Ertogrul Ghazi, the father of Osman I, the founder of the Ottoman Empire. It is sometimes also referred to as Azady Mosque. The design is reminiscent of the Blue Mosque in Istanbul and is an expression of the friendship between the Turkish and the Turkmen people. Both exterior and interior design are exquisite and the mosque is well worth a visit. 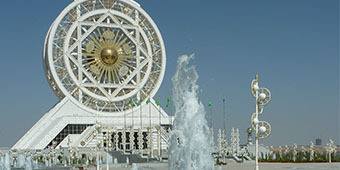 Originally constructed next to the Central Square in the old city center, it was the landmark of Ashgabat, until in late 2011 re-opened at its new location at the southern edges of the city. 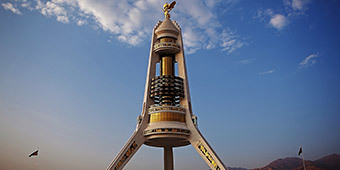 The tripod construction in concrete, with its decorative legs and belt, dedicated to Turkmenistan recognition as a neutral country by the United Nations in 1993. It is famous for the golden statue of the first president of Turkmenistan, that crowns the top. Immediately upon your arrival in Ashgabat you will be welcomed by a vast statue of the mythical founding father of the Turkmen nation, Oguzkhan. Surrounded by Turkmen warrior-heroes is a vast fountain complex that entered the Guinness Book of World Records in 2010 as a facility combining the greatest number of public fountains. The complex is particularly beautiful at night when colored spotlights shine through the rays of water. 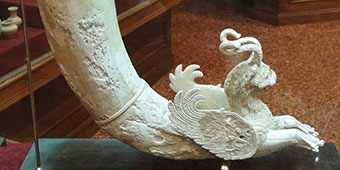 Opened in 1998, the museum's 9 history halls houses the Turkmenistan’s major collection of artifacts discovered at various excavation sites in Turkmenistan. 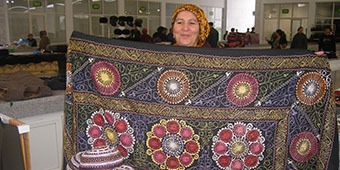 Opened originally in 1994 and re-opened in its new home in 2008, the museum offers an impressive collection of antique and contemporary Turkmen carpets. Many of the carpets in this collection date back to the 17th century. Also it displays two of the largest hand-made carpets in the world: the “Turkmen kalby” carpet is 190 m2 and was made during WWII, and the “Turkmenbashi kalby” carpet is 301 m2, weighs 1.200 kg, and was completed in 2001. 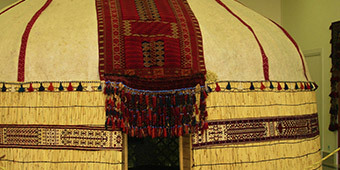 The original bazaar was called Tolkuchka Bazaar (or Push Market) and was the biggest bazaar in Central Asia. Now it has been slightly relocated and renamed Altyn Asyr Gundogar Bazaar. On Thursday and on weekends people gather here to buy and sell fresh food, household items, electronics, and traditional carpets, silk and wool items. On Sundays also camels, sheep and poultry are for sale. It is a good opportunity to collect souvenirs, but also to simply watch people from all walks of life and their livestock. Since 2012, Ashgabat hosts the world’s largest Ferris wheel in an enclosed architectural design. It measures 47,60 meters in height, and has a diameter of 57 meters. A large glass and white-steel casing houses the Ferris wheel, which has 24 six-seat cabins. At night, the construction is beautifully lit my multi-colored spotlights. It is located in the southern part of Ashgabat, from where the entire skyline of the city can be admired. 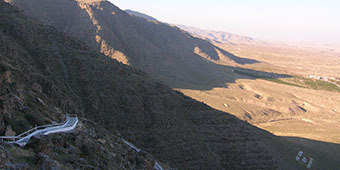 A 33-km long concrete stairway across the foothills of the Kopetdag Mountains, constructed on the orders of the first president of Turkmenistan in the early nineties. Along the route are various access points and little pavilions, and at night the whole route is lid up. At the entrance of the Stairs in Berzengi you can climb up a short distance for nice views over the city and surrounding lowlands. 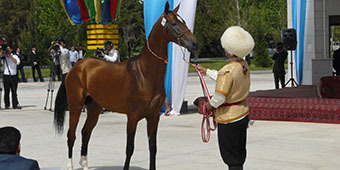 Every Sunday in spring and autumn horse races take place at the National Hippodrome, located at the eastern outskirts of Ashgabat. 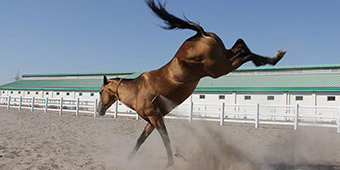 A visit to such a race gives you a rare opportunity to see the powerful Ahalteke horses in action. On the last Sunday of April, the Hippodrome is the venue for the celebration of the National Race Horse Day. For more information contact us directly. A variety of Ahalteke private horse farms and stables can be visited for those that want to observe these gorgeous horses from a safe distance. For those that want to ride one of these temperamental beauties, various stables are able to organize short (one-hour) to long (1-8 days) trips.